Ben Lomond is not a lush part of Tasmania. Too high for trees; too windy for soft-leaved foliage; too rocky and cold for deep soils, it feels underfed, gaunt, boney. It is not a place for comfortable rest. Except perhaps on a rare, calm summer’s night, when a storm has passed and the wind-blown sediments cover the earth’s bones well enough for a tent to seem almost snug. On such a night the universe will wheel silently above, and you will think there is no finer place on earth. Our calm night is followed by a fine day, perfect for exploring the south-western edge of the plateau. But we have a complication in the day’s plans. Our mate Tim has decided to join the group late, coming up via Stacks Bluff. “I’ll meet you before tea on Tuesday at Lake Youl. What could possibly go wrong?” We’ve heard that before: but we put that niggling doubt to the back of our minds and make for Grant Cirque. The nomenclature of the plateau reflects the English-speaking world’s fascination with the search for the source of the Nile River in the 1850s. 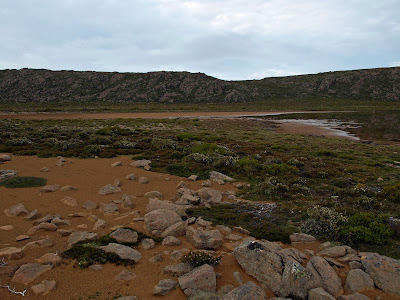 So a modest stream rising near this end of Ben Lomond plateau is named the Nile River, and a number of features are named after Nile River explorers, including Speke Gorge, Baker Lake and Grant Cirque. Sphinx Bluff too has an obvious Egyptian link. Our own imaginations are more fired up by what we’ve heard about Grant Cirque. Geologically-speaking Ben Lomond’s boulderfields, the result of millennia of ice action, are some of the most extensive in the southern hemisphere. We have experienced a little of that in getting to Lake Youl, and have more boulder hopping to do on our way to the plateau’s edge. But Grant Cirque is the result of ice action of a different kind. Where all on the plateau has varied only quietly from the horizontal, here the vertical begins to shout. If it is a cirque, is has no classic bowl-shape. Rather it is a giant, sloping, shovel-shaped groove. It has been cleft at Speke Gorge where the upper Nile River has gouged a path to the Midlands. The beauty of the place is undeniable if austere. The bones of the earth are laid bare in a manner more reminiscent of the arid MacDonnell Ranges than well-watered Tasmania. It’s a reminder that harsh conditions for soil and plants can result from cold as well as heat. And that cruel conditions can result in deep beauty. We enjoy a slow lunch on this bouldery edge, perched like eagles above the distant, straw-coloured Midlands. I work out that we’re probably sitting atop one of those “slices of bread” visible from the highway down there, with Speke Gorge one of the more visible gaps. 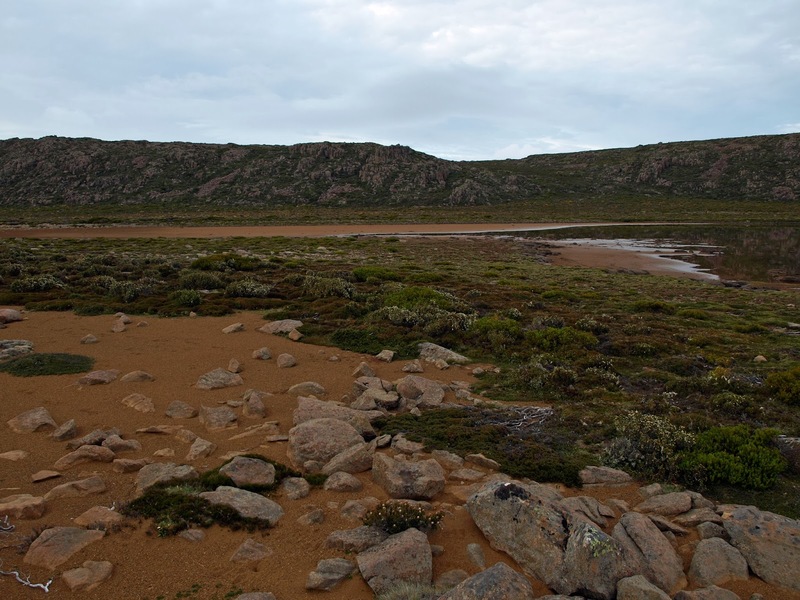 On our return to Lake Youl we take a wide arc south, hoping to intercept Tim on his way up from Stacks Bluff. There is no sign of him on any of the routes we’d expect a walker to try after gaining the plateau’s edge. What could possibly go wrong? We run our minds through a long list, and settle on “I left a little late” as the most likely in Tim’s case. And so it proves. After dinner, with only hot drinks and chocolates to come, Tim yodels from a distant hill to announce his arrival. We’re glad to see him: and to give him a clip around the ear! He is three or more hours late (yes, he left a few hours later than planned). It’s been a long, steep climb, and he’s glad of a bit of help heating up dinner and some soup. It seems cruel that the next morning he’ll have to pack up and join us on our return via Stacks Bluff. But he seems happy just to be here; happy enough to even have a sunset dip in the lake after his dinner; happy also to taunt us – and especially Jim – about the steep, exposed route we’ll be taking tomorrow. But in the morning our first task, after we break camp, is to get to the summit of Stacks Bluff. I’ve been waiting to do that for three decades! For all the verticality surrounding it, the top of Stacks Bluff is relatively flat. Even the summit cairn is modestly low; a flattened scone rather than a wedding cake . 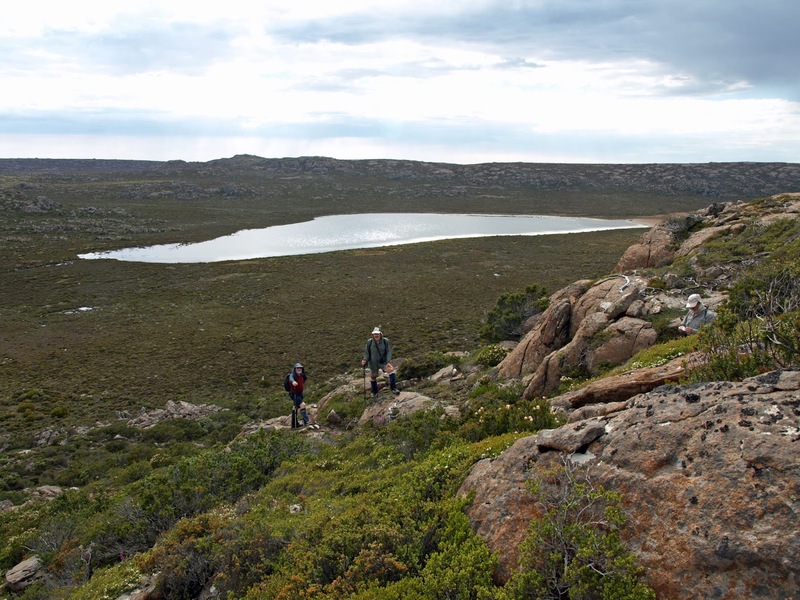 All around us scoured and fissured lumps of dolerite and tough, dark green scrags of vegetation hint at the climatological and geological rigours of this place. But today all is calm, wide and handsome. We enjoy our summit moments, knowing that we’re in for a hairy, steep descent. We expect Tim to lead us straight to the downward track, but he manages to miss-place it for a few minutes. He scrabbles around for cairns, eventually pointing to a very unlikely looking chute, and calling us cheerily down. 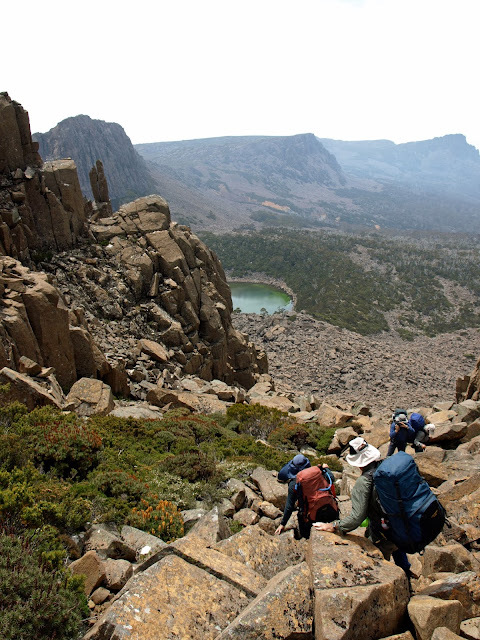 What follows is as steep and bouldery as any of Tasmania’s classic dolerite scree descents; harder than Ossa or Cradle. In a few spots, given our full packs, we choose to go down backwards, which affords us amazing views of the huge buttresses of rock through which we've descended. It's a hot day and we move slowly, especially Jim, who is uncomfortable boulder-hopping on rocks this large and (occasionally) mobile. A short way down we start to see distant bushfire smoke, just as Tranquil Tarn comes into view. It is perched nest-like on the slope far below us. A classic hanging cirque, its bright green waters are rimmed by boulders and vegetation. Once we negotiate the seemingly endless boulder fields, the lure of the water takes a couple of us off track. It lives up to its name; calm and peaceful, although it's not a place that invites camping. The shore is very rocky, and there are no flat spots for a tent. We have a long drink and get back to the bouldery descent, which persists for a while yet. Finally the slope lessens, trees start asserting themselves, and we come out onto the 4WD track that will lead us to our cars. We’re glad to stop walking at last; glad too to find the vehicles unmolested – there had been stories about Storeys!